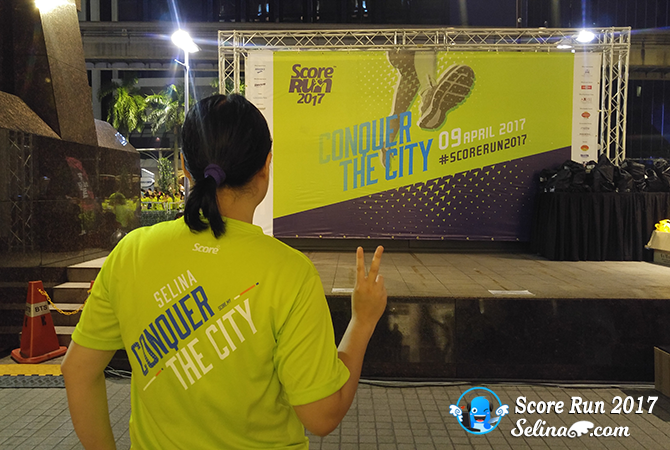 My sister, Jocelyn and I excited to run along 6km during the Score Run 2017 as we back to conquer our heart of city, Kuala Lumpur again. 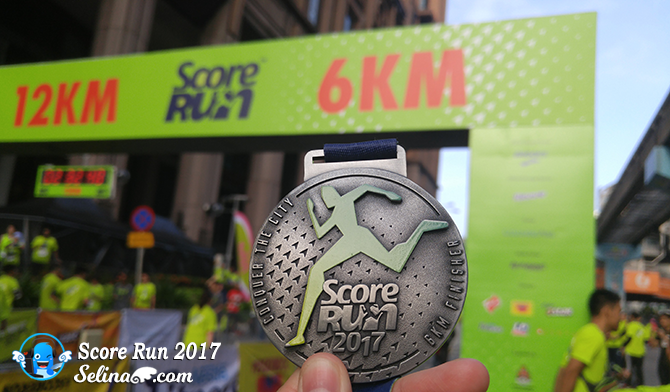 My good friends also joined me too because they decided to take part in the Score Run 2017 again. 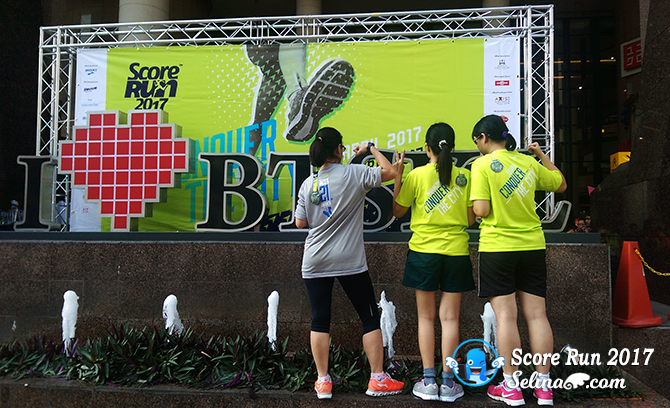 Since my friends and I fell love in the Score Run 2016 already, their company organised this event so very improved so better on last year, we still remember that we happy to get our T-shirt with the names, so cool. 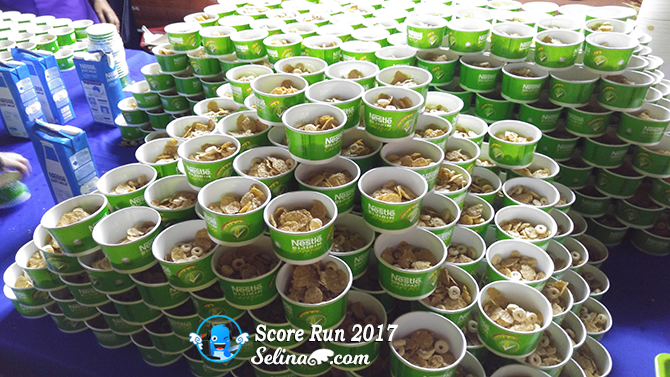 Please read my previous post, Score Run 2016 - click link here. 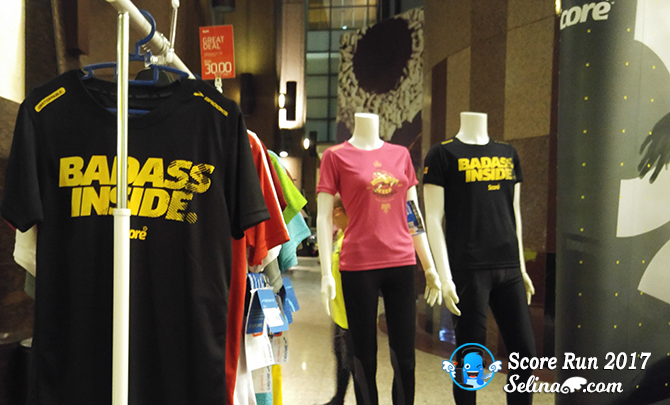 Now, they put the limited T-shirts with the names for the early-bird runners only. That is why my friends and I registered so very early! 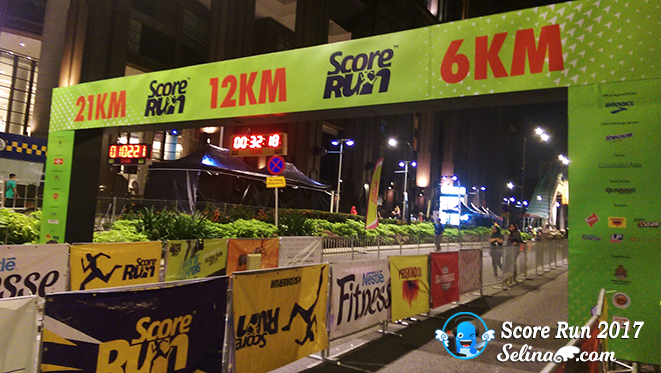 My best friend, Kimberly rushed to her first wave, 21km at the start line of Score Run. So, we explored around the big area, which the runners are waiting for the flag time. 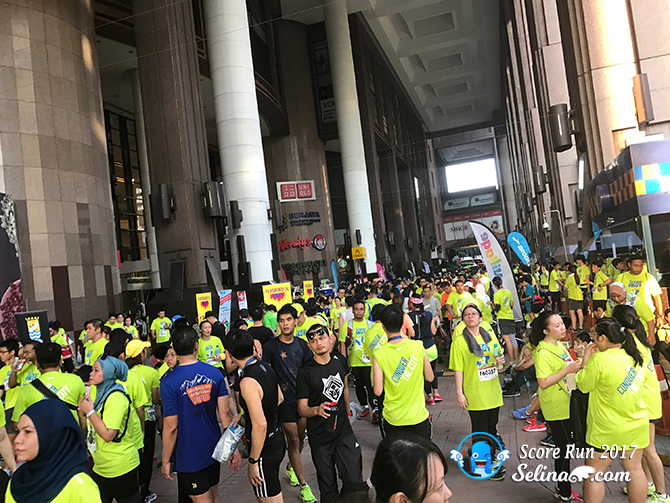 Wow, Score Run 2017 managed to get many runners who joined the 21km, 12km, and 6km on first time. 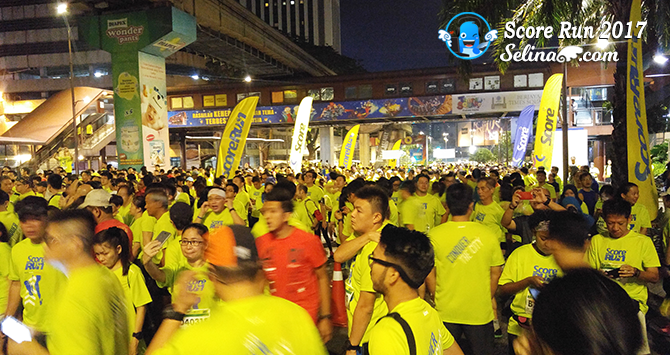 Surprisely, really a lot of runnners interested in 21km and 12km than 6km! There are some have their own names on T-shirts and some don't have put their own names. 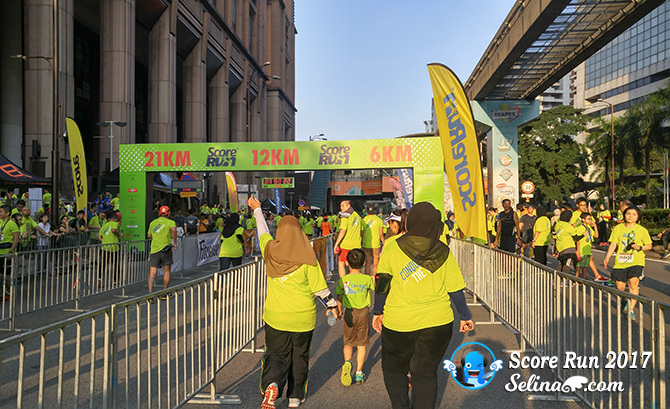 After we waved our hand when Kimberly busy to focus on her challenge of 21km, my friend, Woan koon and I explored different booths at the entrance of Berjaya Times Square... 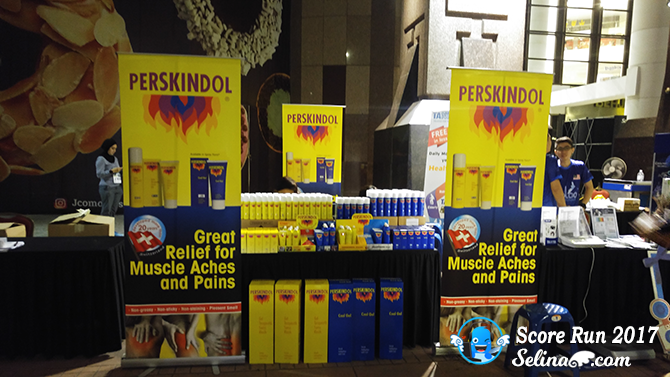 There are the sponsored companies; Biken, Brooks, Perskindol, Nestle, and others. We don't plan to buy anything from their boothes, because we don't bring money so much. 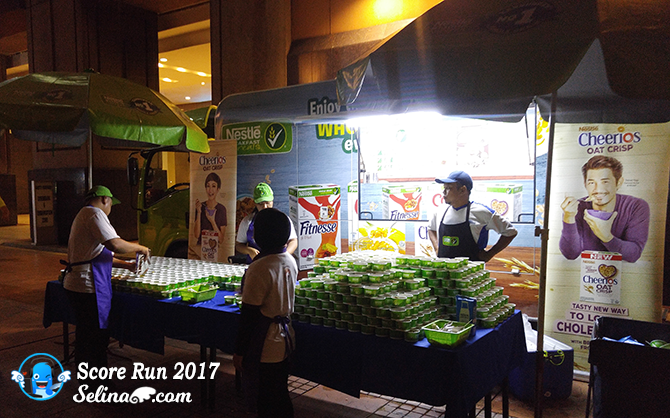 We happy to see the Nestle booth to prepare the breakfast for the runners at very early morning. 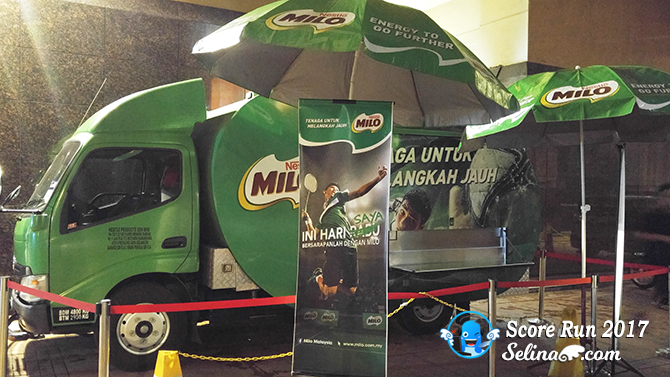 We are missed the Nestle Oat breakfast so very much... Wow, there is a Milo's truck are parking! We love to drink milo so much! 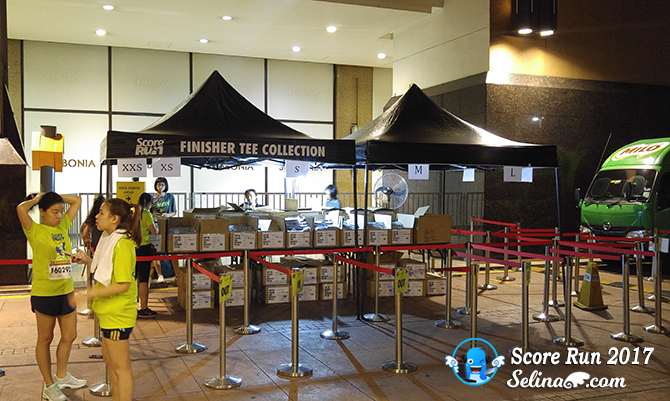 Woan Koon mentioned about the Finisher Tee Collection booth just for the 21km runners who complete the challenge of running only! I surisped to see all Tee T-shirt's color are GREY only! 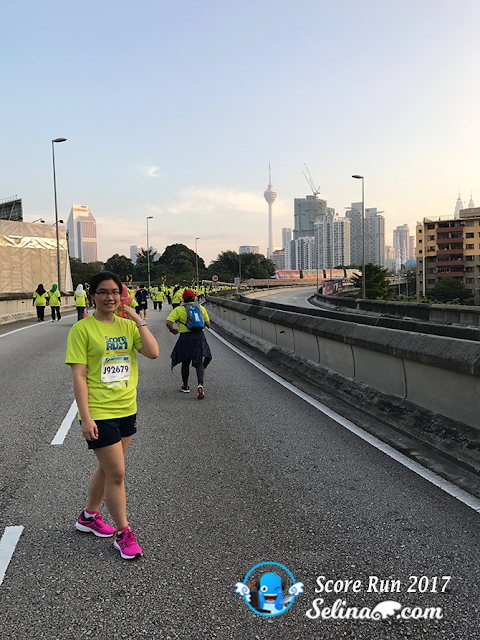 Kim sure very happy if Kim success to complete her 21km challenge! 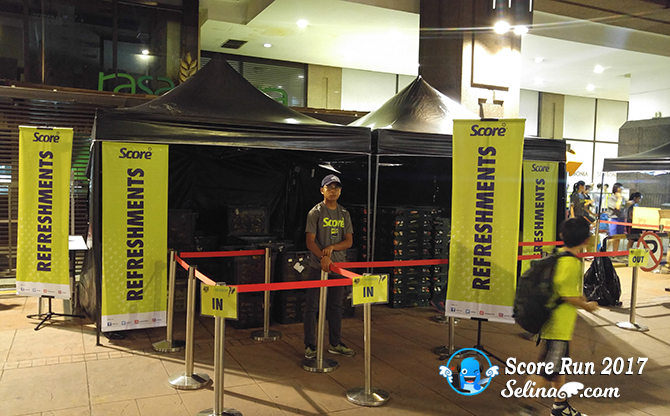 Once we finished to check around the boothes, we are lucky to spot the Score Run's booth, and got discount of parking ticket, just RM6 for an event-day only. My friend and I rushed to our flag time and be ready. My sister and her boyfriend will catch us later when we are busy to run, walk, run, walk, run so non-stop...Until we noticed that we are running along the same highways again. 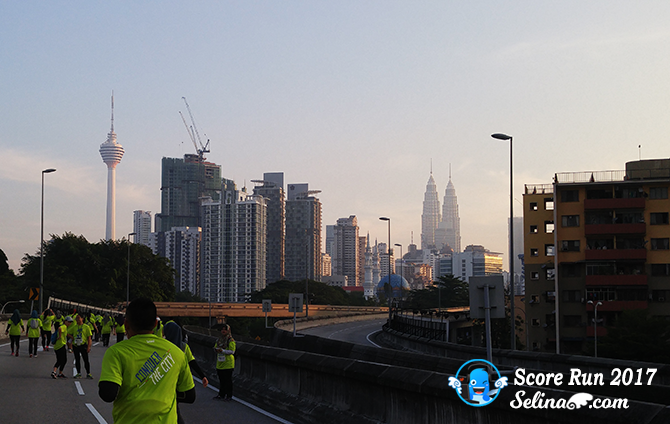 It's okay because we are very enjoyed to view the KL tower, KLCC, and skyscapers at same time. You can see my name so clear when I challeneged my running lane at the highway. And you can view the famous KL tower so well too! My sister, Jocelyn and her boyfriend suddnelly pass over me and Woan Koon so I surisped when she managed to catch us at same lane! She enjoyed to take her photo on her first time too. Haha. Finally, we completed our mission of running at the end lane! 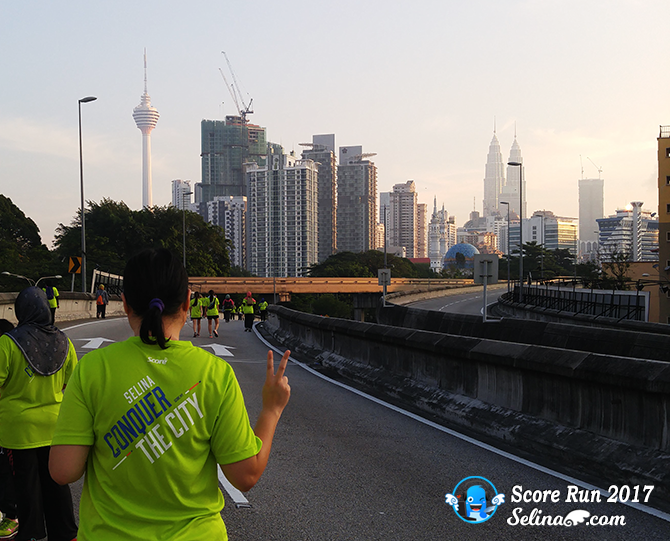 Before this, I noticed many 21km runners still are on their mission to finish...after 12km and 6km finished. Maybe they take their time to complete in 3 or 4 hours. It is very challenging for my best friend, Kimberly! Wow, my medal is very beautiful! I love it so much! What! Wow! 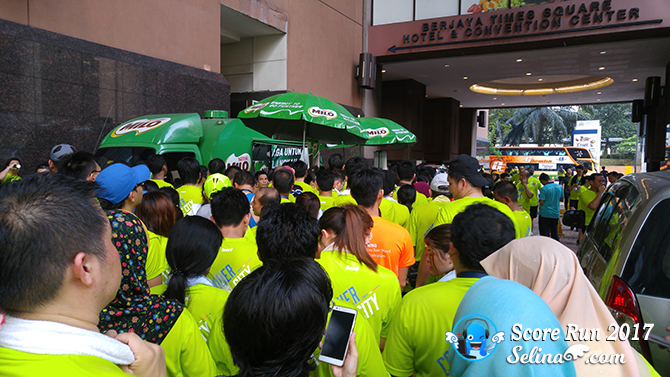 Too many runners rushed to be queue in long...Hmm, I think that they should put two Milo trucks at different area for the runners so easier. 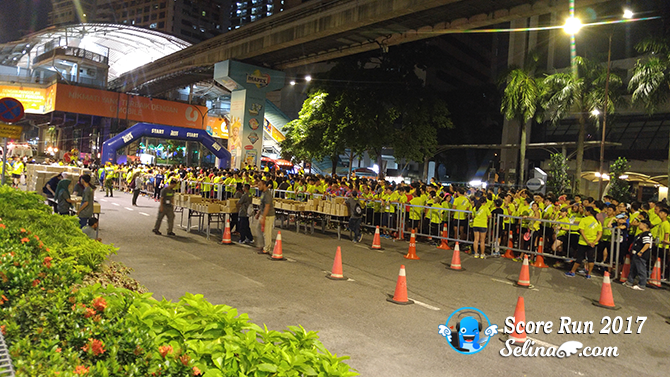 Pity a Milo staff are very busy to give the cups to each runners...I saw some runners grabbed two cups too! We also took 2 cups only. Not easy to get in! I hope that Score Run should put 2 or 3 Milo trucks so better if too many than 2,000 runners. 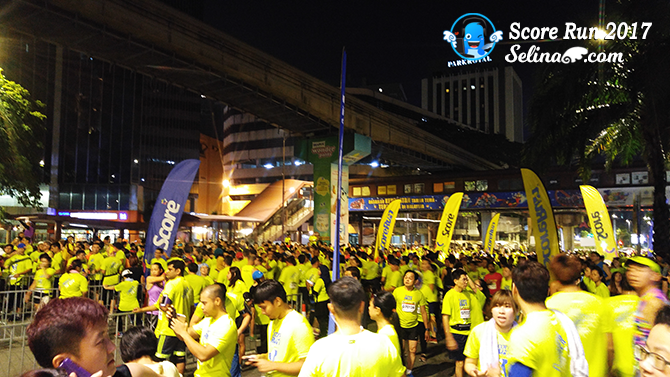 We shocked to see any runners enjoyed to eat the free ice cream. 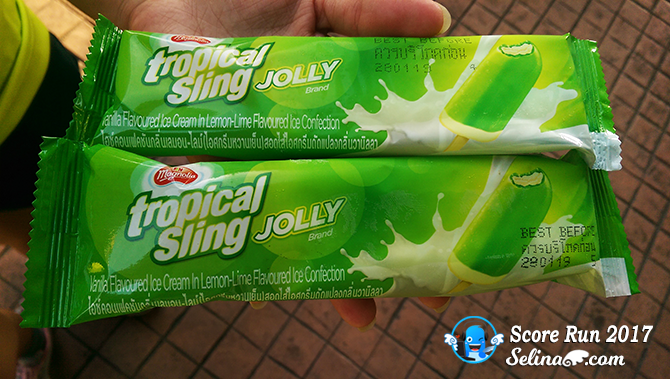 I asked other runner about how we can get this kind of ice cream, then she said, we should look for the ice cream's truck, and can get FREE ice cream flavour lemon and lime! My sister and I love this ice cream so very much! The Berjaya Times Square still be alive until noon, the runners enjoyed to sit inside the Starbucks, or they also shop at 7-eleven shop too! 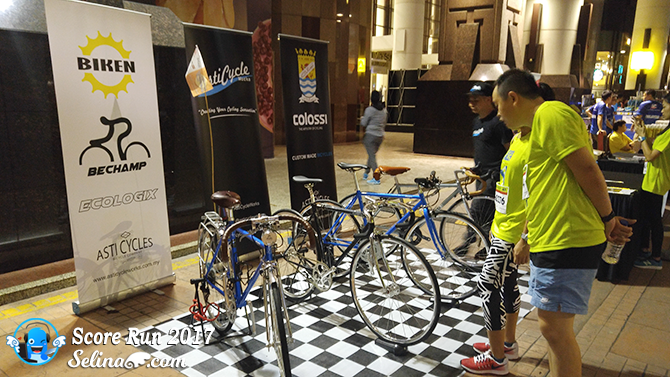 They also look for the few restaurants which are opened for the breakfast, that near the Berjaya Times Square Shopping Mall. 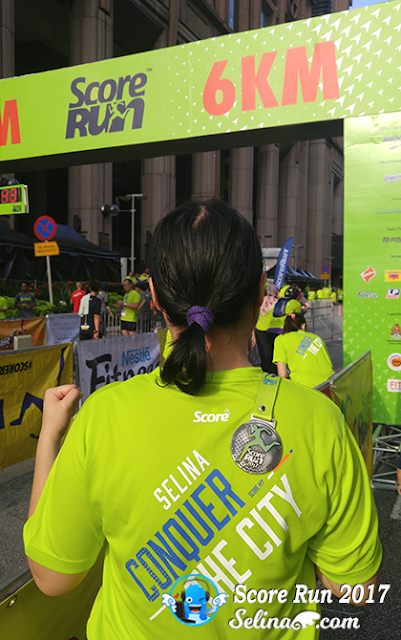 We are very happy when we spotted Kimberly walked to reach the Starbucks after Kimberly collected her finisher tee T-shirt so cool! We worried that Kimberly's smartphone was almost be out of battery! Good, Kim managed to whatsapp me when we still waited for her at the entrance. Kim are very hungry than us so wow. We took our cool photos before we back home. 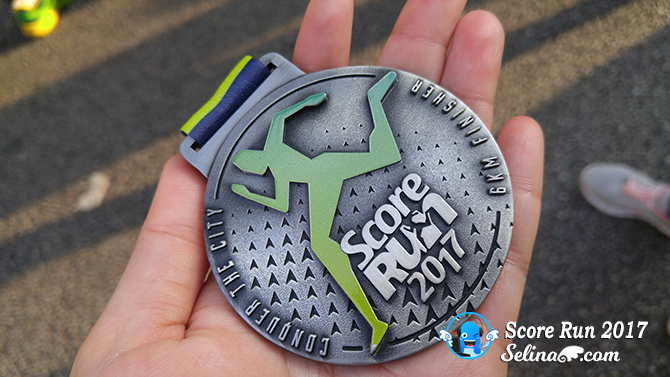 We heard that Score Run 2017 want to organise new event, "Score Night Run" again but we not sure if we confirm because maybe they will decide to host same place again? Boring if they keep same venue only. Hope they put different venue so it is very interesting!